Felicitation to Dr. Catherine Kyobutungi on her appointment to the Netherlands-based institution. The new role will see her focus on engineering Africa’s healthcare systems that promotes and supports access to prevention and treatment of Non-communicable diseases (NCDs). With the appointment, she aims to set up a research program on chronic disease management that will strengthen the responsiveness of health systems to infectious and non-communicable diseases. 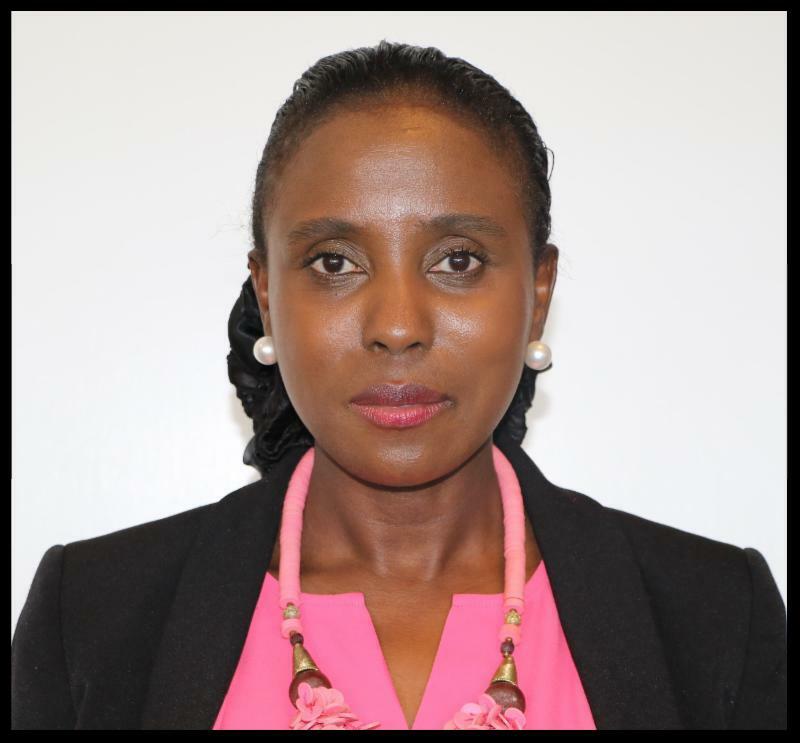 Dr. Kyobutungi, the executive director of the African Population and Health Research Center (APHRC), will also explore the role of digital technology and innovative healthcare financing in bridging the gap between patients with NCDs, their families and the healthcare system. Read more about her new role here. 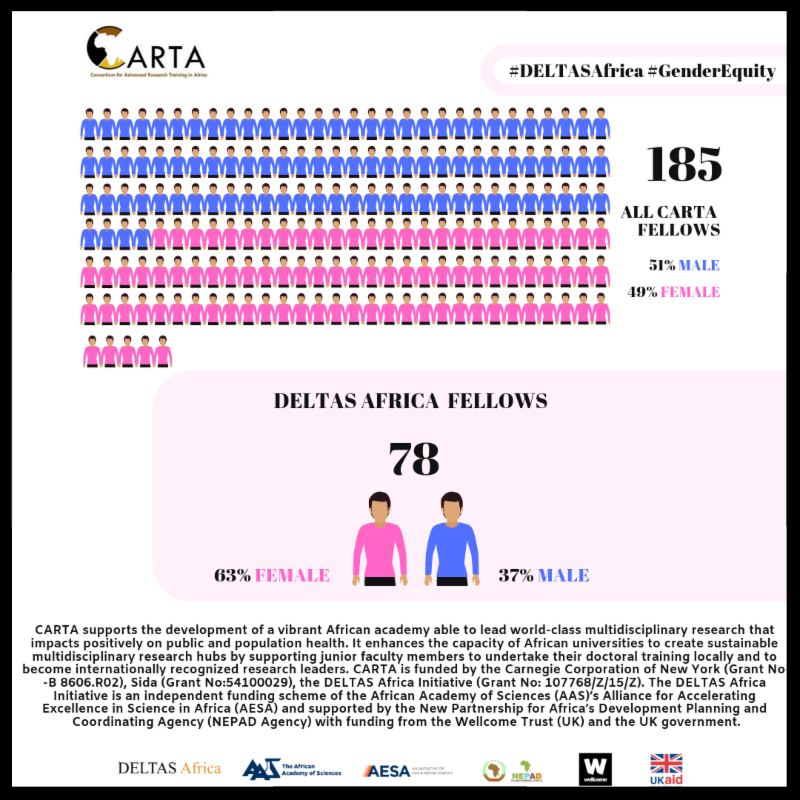 Did you know that in the three years of its implementation, DELTAS Africa (one of CARTA's funders) has recruited close to 992 master’s, PhD and postdoctoral fellows, 48 per cent of whom are women? We are participating in the conference held from October 31 to November 2, 2018 in Nairobi, Kenya that has brought together 300 participants (scholars, professionals, key policy makers, industrialists). Our co-director Dr. Catherine Kyobutungi is expected give a keynote address on November 1, 2018 on doctoral training, research and outreach in a session chaired by our program manager Dr. Florah Karimi. The forum's theme is “ positioning Universities as the nexus of research, innovation and technology transfer for Socioeconomic Transformation ”. The sub-themes are Science, Technology and Innovation for National Development; Quality Assurance in Higher Education; Technology Transfer/Commercialization of Research Outputs; Collaborations, Partnerships and Linkages; and Doctoral Training and Research. The event will also provide a platform for universities to showcase their cutting edge research outputs and innovations. 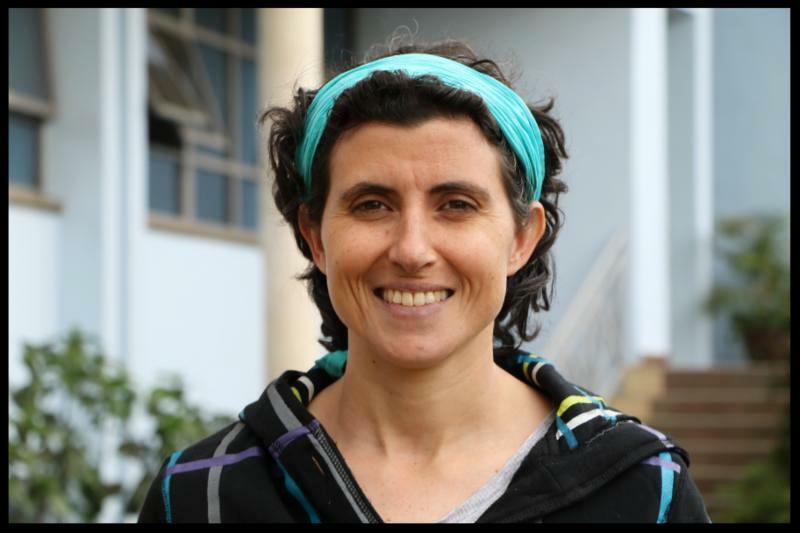 We are pleased to welcome Dr. Marta Vicente-Crespo to CARTA, to serve as one of the two program managers. She has close to six (6) years of considerable experience in research capacity strengthening at a number of African universities. She has organized successful technical workshops to increase the exposure of postgraduate students and staff to biomedical research and data analysis techniques. The secretariat is excited to have her join the dedicated team that will continue to grow and expand opportunities across the continent for African scholars to become great research leaders. Read her profile here . Our three fellows Adeyinka Adefolarin (Cohort Three, from the University of Ibadan, Nigeria), Boladale Mapayi (Cohort Four, from the Obafemi Awolowo University (OAU), Nigeria), and Oyeyemi Olajumoke Oyelade (Cohort Eight from OAU) contributed to this that put a spotlight on the need to promote and to protect adolescent mental health. 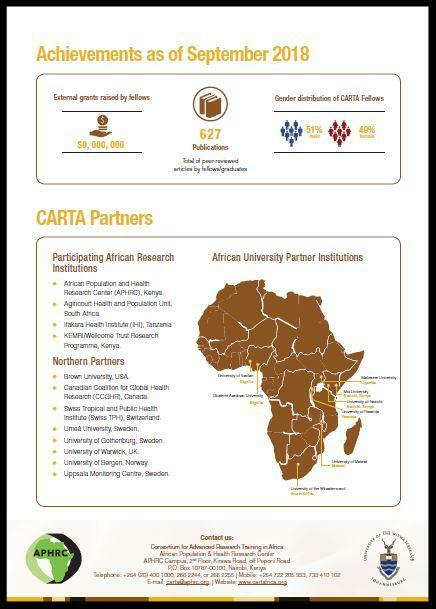 The CARTA 2018 Annual Fact sheet (on the left) which unpacks how our three innovative approaches enhance the capacity of African universities by supporting junior faculty members to undertake their doctoral training locally. These two articles that would be of interest to new doctoral students and this one would be a great read to senior faculty and those interested in higher education. Share with us what you are reading and it will be featured in the next monthly update. This CNN article on esophageal cancer quotes research done by CARTA Cohort Two Graduate, Diana Menya from the University of Moi. Our Cohort Four Fellow Henry Zakumumpa from the Makerere University writes in the Conversation Africa why integrating HIV with non-HIV services in Uganda won’t work. Jepchirchir Kiplagat (Cohort Five): HIV testing and counselling experiences: a qualitative study of older adults living with HIV in western Kenya. Sunday Adedini (Cohort One): Role of Religious Leaders in Promoting Contraceptive Use in Nigeria: Evidence From the Nigerian Urban Reproductive Health Initiative. Joint Advanced Seminar (JAS) 2 for Cohort Eight Fellows at the University of the Witwatersrand, South Africa from November 5-28, 2018. JAS 2 focuses on data management and analysis. Fellows will learn how to use software packages for qualitative and quantitative data management and analysis. Supervisors Training workshop from November 26-29, 2018 for supervisors of Cohort Eight Fellows attending JAS 2 at the University of the Witwatersrand, South Africa. 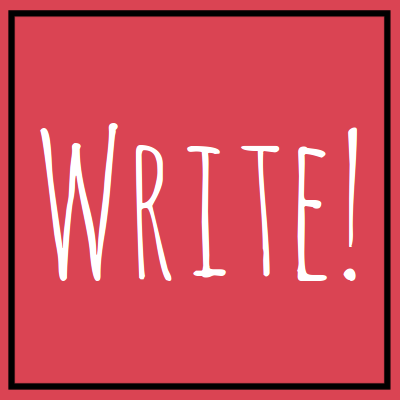 Can you write? The Conversation Africa is looking for you! Write about the findings or new research in your area of expertise or your doctoral study. The Conversation Africa is a highly reputable and credible source of information to improve the quality and scope of public discourse. Interested? let us know. Do you have a PhD and are interested in governance, gender, community, social change & health systems? Check and a pply here for this post doc opportunity. Deadline: November 2, 2018 . Apply for the upcoming Immunology in the Tropics course on TB by the Makerere/UVRI Infection and Immunity Centre of Excellence. The two-weeks course is suited to PhD and MSc candidates, or clinicians and lecturers wishing to update their Immunology knowledge. Deadline: November 2, 2018. Download th e application form for here . Emerging Global Leader Award. Deadline: November 7, 2018. Click here to apply. Chronic, Non-Communicable Diseases and Disorders Across the Lifespan: Fogarty International Research Training Award (NCD-LIFESPAN) (D43 Clinical Trial Optional). Deadline: November 13 More information visit this site. The Bill & Melinda Gates Foundation is inviting proposals for the latest round of the Grand Challenges Explorations initiative. Deadline: November 14, 2018. Present a Digital Poster at the Women Deliver 2019 Conference in Vancouver, Canada. Deadline November 16, 2018. Call for papers and participation for the 9th KEMRI Annual Scientific & Health (KASH) Conference . Deadline: November 30, 2018. The National Academies of Sciences, Engineering, and Medicine is accepting applications for the 2019 Ford Foundation Fellowship Programs. Eligibility and online application information are available on the Ford Foundation Fellowship Programs website . Deadline: December 13, 2018. Next Generation Social Sciences in Africa doctoral fellowship at the Social Science Research Council (SSRC). Deadline: December 15, 2018. Apply for the African Academy of Sciences-Gates-German partnership that spurs health innovations by building momentum for global health and foster scientific collaboration among international groups and researchers . Wellcome Photography Prize 2019 open to photographers and other image makers from all disciplines to enter the Wellcome Photography Prize, which celebrates compelling imagery that captures stories of health, medicine and science. Deadline: December 17, 2018. Click here to apply . Download this list of other funding opportunities collated by the APHRC Development Office . For other opportunities check the CARTA website . Share with us any news and updates such as published papers, policy briefs, community engagement activities, scholarships, what you are reading, won a grant, attending or about an upcoming conference, a call for applications/funding/papers. Share before November 16, 2018 to be included in the next CARTA news & updates.